Titre original : Grizzly's Hibernation Preparations! / Grizzly's Hibernation! 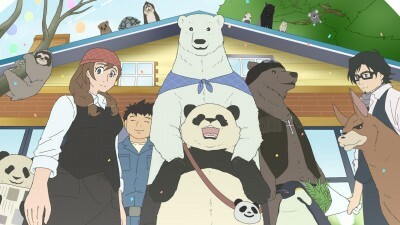 The pandas look for ways to hibernate at the zoo, but Handa calls them out on it. Grizzly takes Polar Bear shopping for a pillow to sleep on during hibernation, but Polar Bear doesn't seem to be interested in that. When Grizzly does get to hibernate, he is rudely interrupted by Polar Bear, who takes him to the driving range. When Panda and Penguin turn up, Grizzly, cranky from lack of sleep, takes them all out to a hot pot bistro.